gCaptain had a report on this new hull form, which a University of Iceland study found reduced slamming as much as 95% compared to a deep-v hull. It explains the development of the hull, I needed more information to understand how it worked. The company website has many much clearer photographs as well as the video above. Exceptionally smooth and comfortable due to limited slam on waves. Significantly reduced slamming results in less mechanical and equipment fatigue, extending the lifetime of expensive electronic equipment on board. Precision performance without compromising cruising or top speed. Could this concept be scaled up for a Motor Surf Boat? Apparently the Icelandic Association for Search and Rescue is already looking into the possibility of a 15 meter (49 foot) MLB. 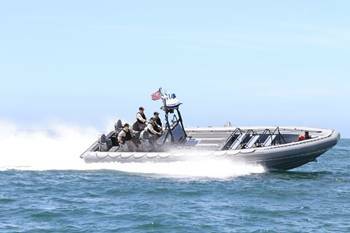 MarineLog is reporting the Navy has licensed a Willard Marine design to serve as their standard 11 meter RHIB. 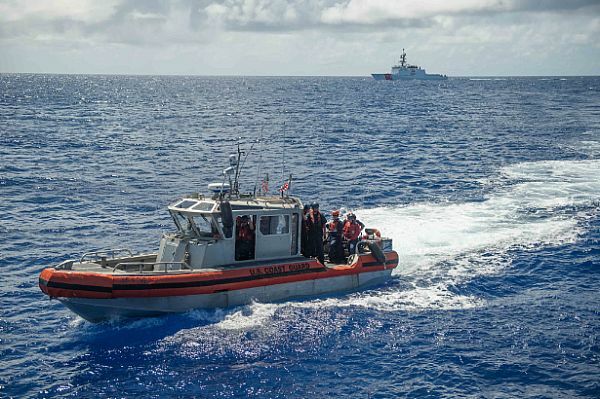 These are similar in size to the Long Range Interceptor (LRI-II) boat that deploy from the stern ramp on the Bertholf Class NSCs, but they lack the weather protection of the Coast Guard boats.